Collaborative pieces of Gdańsk School of Mural painted in the Monumental Art Collection in Zaspa. 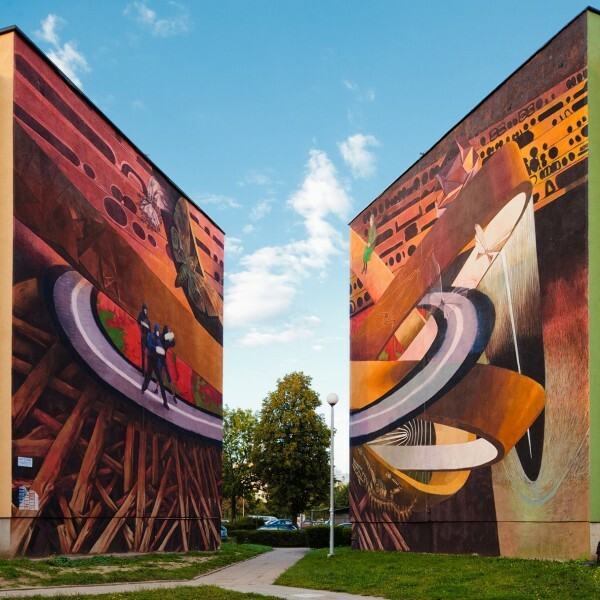 More info Gdansk School of Mural. The starting point in the design process was a diver submerged in the depths of the Baltic, observing the shoals of various creatures and objects around him with horror. A different artist was responsible for each shoal. The tones of the mural recall the actual colour of the Baltic. Justyna (Dziechciarska) Posiecz-Polkowska, Anna Taut, Emil Goś, Rafał Roskowiński, Michał Węgrzyn, Wojciech Woźniak, Jacek Zdybel. 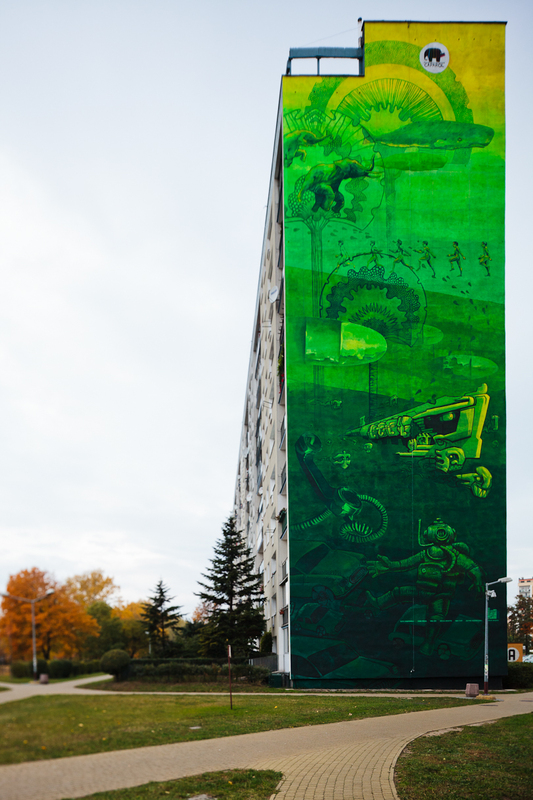 The project task for the year 2011/2012 at the Gdańsk School of the Mural was to create a mural inspired by Polish painting. After a series of unsuccessful attempts to produce pop interpretations of Matejko, Kossak and Chełmoński, the breakthrough came when attention turned to 20th century painting. In this way, after an idea by Professor Jacek Zdybel, a diptych was created visually linked by a ribbon of road and using direct quotations from the Polish 20th century artists Tomasz Tatarkiewicz, Jan Tarasin, Stefan Gierowski i Jan Dobkowski. Ania Taut, Justyna Posiecz – Polkowska, Anna Wrona, Alicja Piskorz, Alicja Czarna, Natalia Buza, Agata Kędra, Wojciech Woźniak, Emil Goś i Michał Węgrzyn.